Do you find yourself being a perfectionist in the studio? Do you make a move, then proceed to question that move? Do you do this over and over again? Sometimes I’m so scared of making a mistake or messing up a song, that it paralyzes me. One of the reasons I set such an ridiculous goal was to force me to stop filtering my ideas. Since I had to write 50 songs, any idea was worth pursuing. There was one song that started off talking about a turtle. Normally, I would’ve never pursued an idea like that, because it was too stupid. But since I had to crank out tons of songs, I ran with it. The result? That turtle song made it onto my album. Had I not given myself the freedom to write anything that came to mind, I would’ve never written that song. Because I was so focused on simply finishing lots of songs, I didn’t question every step of the process. It’s the same way with mixing, amigo. You get better by finishing dozens of mixes, not by perfecting one of them. 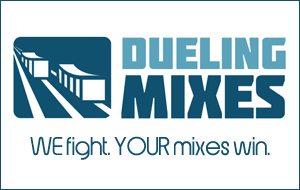 If lifeless, boring mixes are your problem, Dueling Mixes is your solution.